Looking for a unique way to keep warm while still remaining stylish? 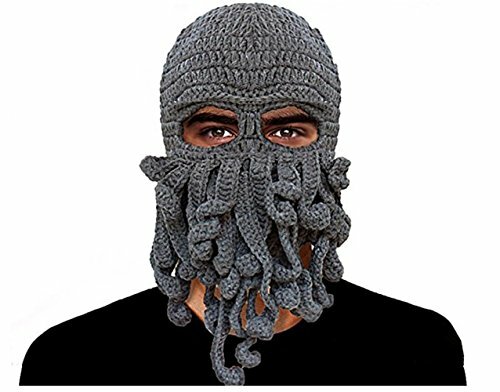 Then look no further than this knitted octopus ski mask! A high demand fashion accessory, this ski mask will undoubtedly look fabulous on anyone regardless of age or gender while keeping you toasty warm. Of course, you could always wear it for Halloween or just for fun. Maybe stand behind a corner and scare your friends with it. One thing is for certain, you’ll be turning a lot of heads wearing this unique garment. Imagine just skiing along with the tentacles gracefully blowing in the wind. It will look picture perfect! So keep yourself warm while remaining your high fashion self. Stand out from the crowd with this octopus beanie! Anyone can buy a regular ski mask, but this octopus ski mask is definitely something you don’t see every day. Made from a soft yarn, this beanie is knitted to perfection making you look your best with a beard of tentacles. You will be the envy of everyone you meet who happens to be wearing any regular knitted ski hat. So grab one for yourself and/or for a friend! It’d be fun if a group of friends purchased an octopus ski mask and wore them while going out!